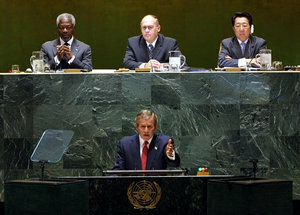 President George W. Bush addresses the United Nations General Assembly in New York City on the issues concerning Iraq Thursday, September 12. White House photo by Paul Morse. On September 12, President Bush called on the United Nations to live up to its founding purpose and confront the grave and gathering danger of Saddam Husseins outlaw regime. To do otherwise is to hope against the evidence  including the systematic defiance of 16 UN Security Council resolutions. The Security Council was created to ensure that UN deliberations would be more than talk and UN resolutions would be more than wishes. Now, Saddams repeated failure to meet his obligations to the Security Council threatens the authority of the United Nations. President Bush announced the United States will work with the United Nations to craft a new resolution to meet our common challenge. This resolution must be backed by the UNs determination to see it through.